I have had a busy week with my latest creation. This is my first ever traditional Christmas card make. I used 6x6 metallic card which I embossed with gold snowflakes. I cut pearlised backing card and distressed it with Tim Holtz inks. I also used a patterned green paper which I found in my paper stash. I cut all of these using my Quickutz nesting frame dies. The image I used is Winter Tilda which I coloured using Copic markers. The Noel letters I already had in my stash of "things I may be able to make use of one day". 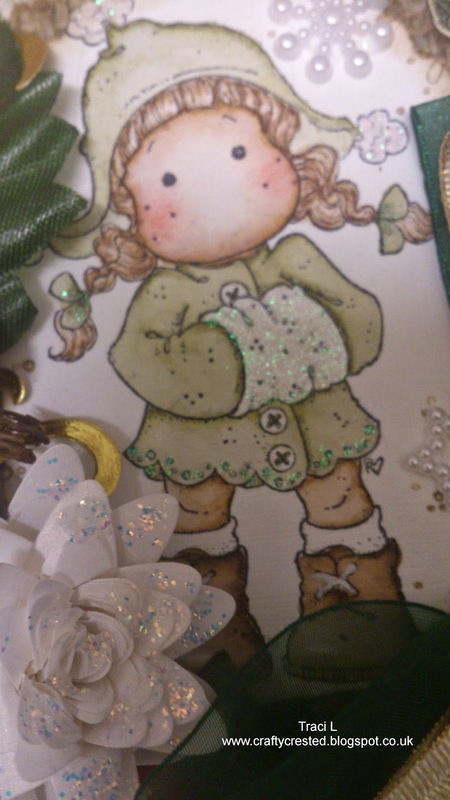 I glittered Tilda using Stickles Icicle glitter glue. The green bow I made from Organza ribbon and the gold metallic ribbon I used to make the bow more interesting. I then added white and red poinsettias along with a fir cone which I embellished using my Gelly Roll white pen and then I finished with various gems. Thanks as always for reading. Please come back soon. Gorgeous card, your triple bow looks fabulous. 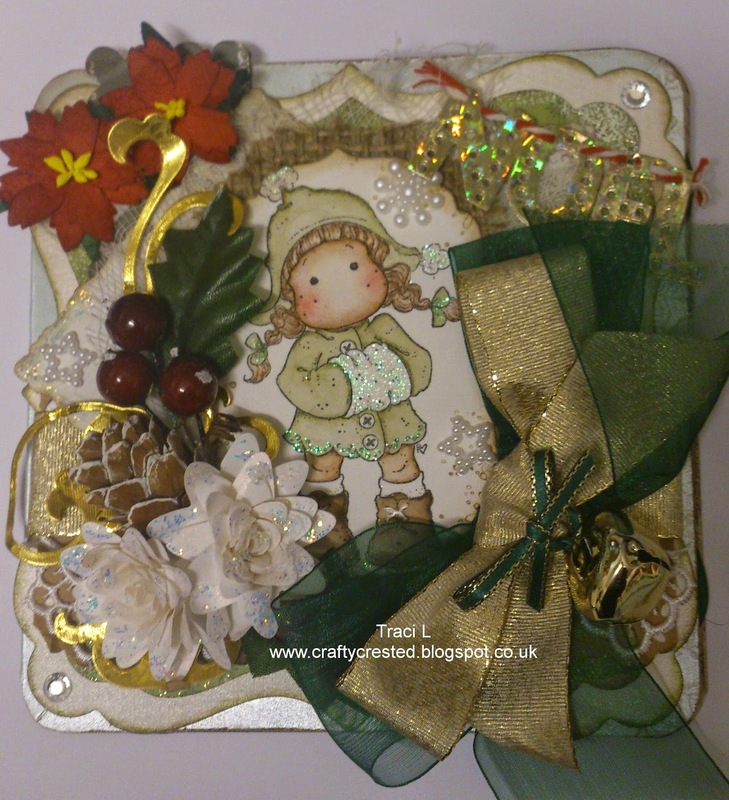 Thank you for taking part in the Crafty Boots Christmas Challenge. Fab card and such lovely details! Thank you for sharing with us at Tilda's Town. Beautiful! So warm and inviting with the golds and greens! Thank you for sharing with us at CIO! Thanks Traci, for sharing your gorgeous creation with us at Simply Magnolia, good luck and happy new year! Great job, Traci! I love the design. I bet it is just gorgeous IRL with the gold elements! Thank you for sharing it with us at the Magnolia-licious Challenge Blog's Anything Goes Challenge! !